This post marks 183 consecutive days with a new educational blog post. With so many folks getting in the habit of using our B&H links and our Amazon logo-links why quit now? To show your appreciation for my efforts here, I do ask that you use our the B&H and Amazon affiliate links on the right side of the blog for all of your purchases. Please check the availability of all photographic accessories in the BIRDS AS ART Online Store, especially Gitzo tripods, Wimberley tripod heads, and the like. We sell only what I have used and tested, and know that you can depend on. We will not sell you junk. We know the tools that you need to make creating great images easy and fun. And we are always glad to answer your gear questions via e-mail. With six new images to optimize, this post took more than 5 hours to prepare. Enjoy! If you have not voted on our next to last category you can do so here. Voting will be open in this category until 6am on Tuesday. This image was created at 7:21am on Friday past at Fort DeSoto with the hand held Canon EF 300mm f/2.8L IS II USM lens, the Canon Extender EF 2X III, and the Canon EOS-1D X. ISO 800. Evaluative metering +1 stop as framed: 1/1250 sec. at f/5.6 in Av mode. AWB. Five sensors to the left of the central Sensor/AI Servo-Surround/Rear Focus AF as framed active at the moment of exposure. Click here to see the latest version of the Rear Focus Tutorial. Click on the image to see a larger version. It’s great having all 61 AF sensors available with the 300 II/2X III TC combo. On Friday afternoon past Jim drove me to Bradenton to explore the possibility of getting some prolozone injections in both shoulders and my left knee. So far so good. We hoped to photograph at Fort DeSoto that afternoon but that did not work out. We got up very early on Friday and were out on the beach before sunrise. As has been typical at DeSoto this year there were very few birds around but the birds that we found were gorgeous, tame, and pretty darned cooperative. Once again I decided to go light with the 300 II and both TCs and to leave the tripod in the car hoping against hope that I would not miss my 600 II too much. Fat chance of that I thought. 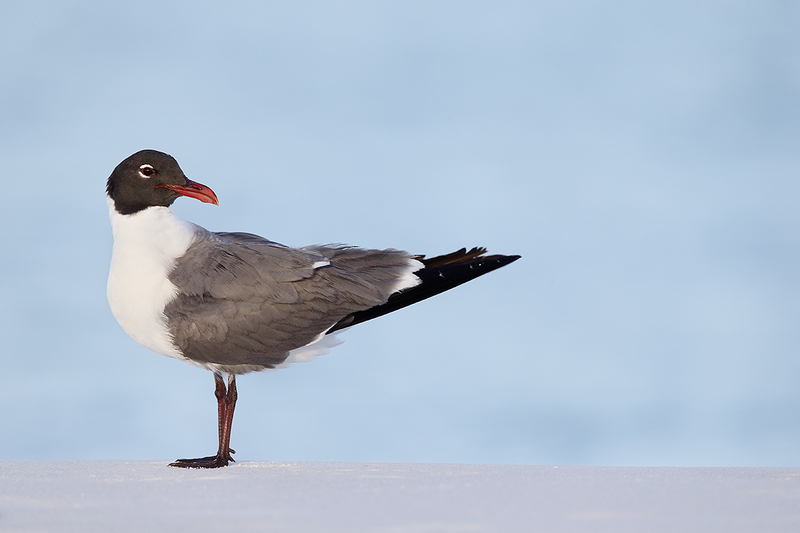 Our first gem was the beautiful adult Laughing Gull standing on a berm of clean sand with a beautiful blue Gulf of Mexico background lit by soft, early morning light. Lying down flat on the sand was the obvious choice and that is just what I did. Nature photography is all about seeing the good situations and then choosing the best perspective. This image was created at 7:38m with the hand held Canon EF 300mm f/2.8L IS II USM lens, the Canon Extender EF 2X III, and the Canon EOS-1D X. ISO 800. Evaluative metering +1 stop as framed: 1/1600 sec. at f/5.6 in Manual mode. AWB. One sensor below the central Sensor/AI Servo-Surround/Rear Focus AF right on the bird’s eye as framed was active at the moment of exposure. Click here to see the latest version of the Rear Focus Tutorial. Click on the image to see a larger version. It’s great having all 61 AF sensors available with the 300 II/2X III TC combo. 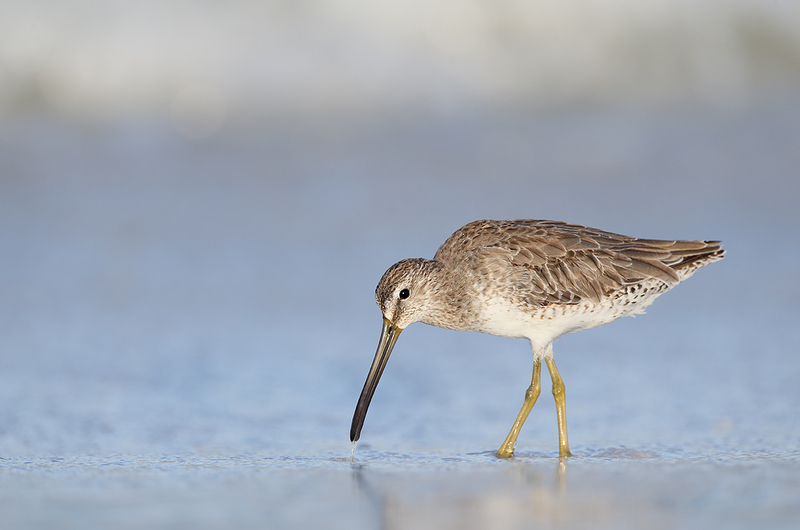 The 300 II/2X III TC Combo for Small Shorebirds??? Yes. Without being restricted by a big lens and a heavy tripod it is fairly easy to keep low and get into position just ahead of the shorebirds feeding along the edge of the Gulf. 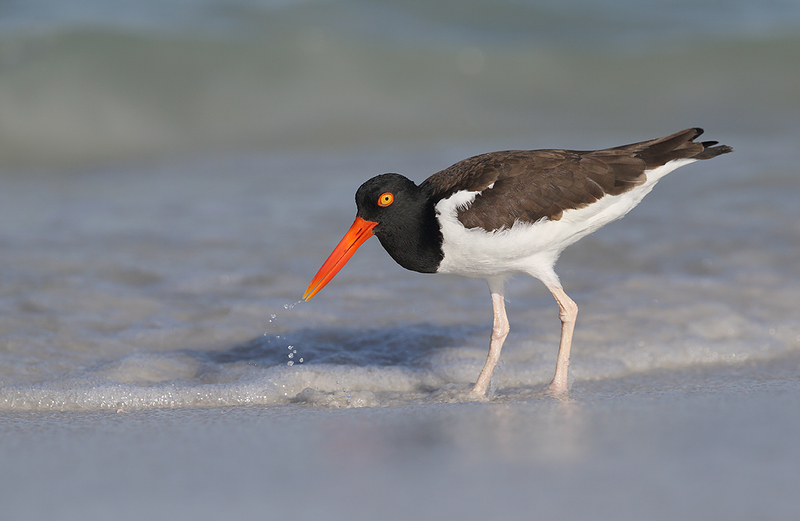 Set yourself down 15-20 feet from the edge of the surf just ahead of sun angle and let the birds work towards you. At many locations the 600 II/2X III combo would have the great advantage of reach that is needed in locations where the birds are not so used to people. 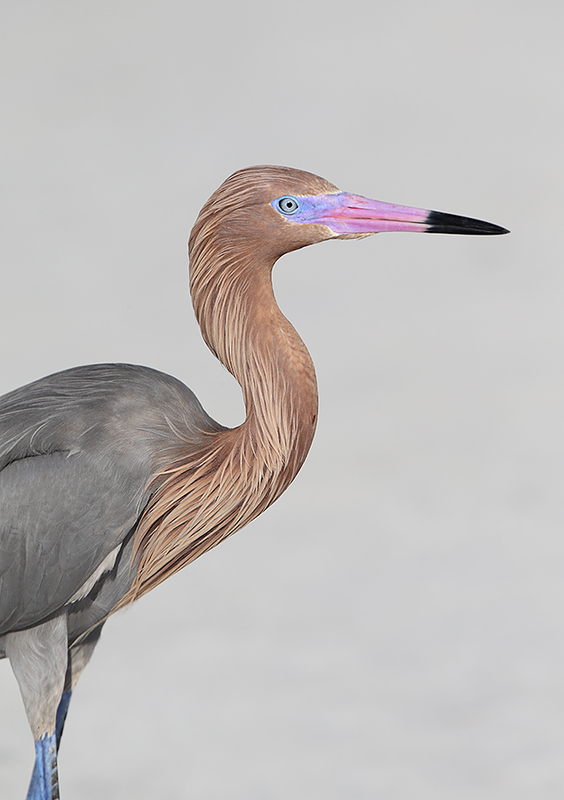 But with Florida’s tame birds the 300 II/2X III TC has the big advantage of mobility. And framing and following the shorebirds as the move quickly along the water’s edge stopping only infrequently to stop and feed for a moment is a lot easier to do with a fairly lightweight hand holdable lens. This image was created at 8:12am on with the hand held Canon EF 300mm f/2.8L IS II USM lens and the Canon EOS-1D X. ISO 400. Evaluative metering +1/3 stop as framed: 1/8000 sec. at f/2.8 in Manual mode. AWB. 61-Point AF activated a tight array of 4 sensors just behind the bird’s head/AI Servo-Surround/Rear Focus AF as framed active at the moment of exposure. Click here to see the latest version of the Rear Focus Tutorial. Click on the image to see a larger version. Working With the 300 II Alone? 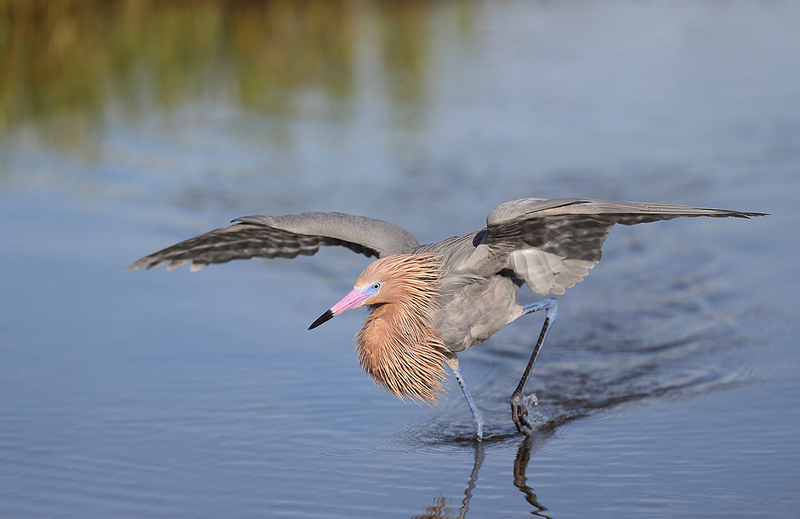 On our way back to the usual sand spit hotspot, we came across a beautiful breeding plumage Reddish Egret fishing in a small pool. Standing was the best plan here as I wanted to avoid having the either the far shoreline (trust me, it was not very far as the pool was a very small one) or the rather extensive reeds as obtrusive background elements. How did f/2.8 help this image? Why did I opt to work without either teleconverter? 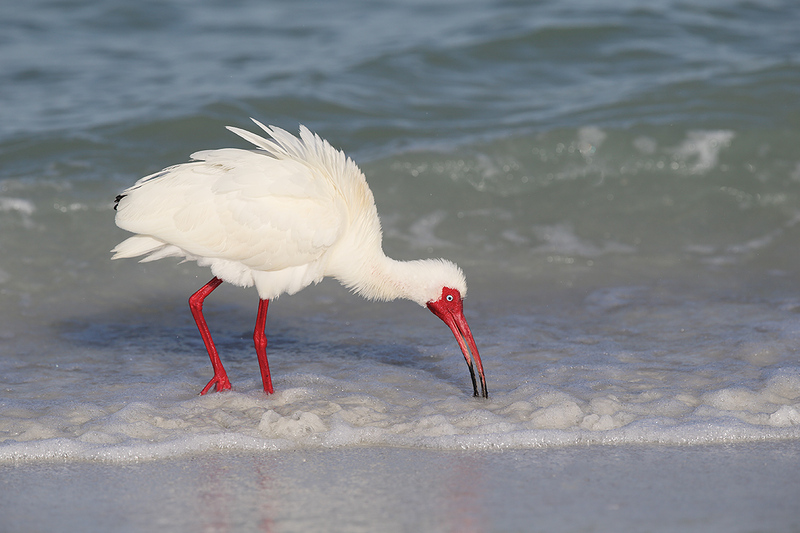 This one was made at 8:21am on Friday past at Fort DeSoto with the hand held Canon EF 300mm f/2.8L IS II USM lens, the Canon Extender EF 2X III, and the Canon EOS-1D X. ISO 400. Evaluative metering at zero: 1/2000 sec. at f/7.1 in Manual mode. AWB. 61-Point AF activated a single sensor at the back of the bird’s neck/AI Servo-Surround/Rear Focus AF active at the moment of exposure. Click here to see the latest version of the Rear Focus Tutorial. Click on the image to see a larger version. When this gorgeous bird walked out of the pool I added the 2X III TC and approached slowly. It began walking to my right and was only able to create a few verticals. I had hoped to get close enough to create some horizontal head portraits but alas, the bird flew off. In retrospect, I would have been much better off working with Surround and selecting an upper sensor…. That’s another way of saying that I should have pointed the lens down to include more of the bird’s cobalt blue legs. This image was created at 8:26am while seated with the hand held Canon EF 300mm f/2.8L IS II USM lens, the Canon Extender EF 1.4X III, and the Canon EOS-1D X. ISO 400. Evaluative metering +1/3 stop as framed: 1/8000 sec. at f/2.8 in Manual mode. AWB. One sensor to the left of the central sensor/AI Servo-Surround/Rear Focus AF as framed active at the moment of exposure. Click here to see the latest version of the Rear Focus Tutorial. Click on the image to see a larger version. It is much easier to move quickly and get down on the ground right on sun angle with the 300 II/2X III than with the 600 II on a tripod either alone or with a TC. My left forearm rests on my left knee making it easy to hand hold while following the foraging or running birds. Knee-pod images are coming soon. This image was created at 8:42am with the hand held Canon EF 300mm f/2.8L IS II USM lens, the Canon Extender EF 1.4X III, and the Canon EOS-1D X. ISO 200. Evaluative metering at zero as framed: 1/2500 sec. at f/5.6 in Manual mode was a slight under-exposure. AWB. Central sensor/AI Servo-Surround/Rear Focus AF just caught the bottom of the bird’s black hood as framed was active at the moment of exposure. Click here to see the latest version of the Rear Focus Tutorial. Click on the image to see a larger version. By 9:45am we were done. I had created a jumbo jet’s worth of RAW files during our short morning session: 747 images. 123 keepers after the 1st edit. As we were walking back to the car I had my revelation: If I had brought the 600 II and my Gitzo 3532 LS tripod to the beach that morning I would not have done nearly as well as I did with the lighter 300 II. When working with tame birds the 300 gave me great versatility as a quick peek at the images here shows; I used the 300 II alone, I used it with the 1.4X II TC. And with the 2X III TC. But more importantly the biggest advantage that the 300 II has for me is that it allows me to be much more mobile. The freedom that comes with hand holding allowed me to stay on sun angle and get to the right spot quickly with less physical effort. Who’d of thunk it??? I say often that the longest lens is not always the best tool for a given job. I am glad that I finally learned that lesson for myself. Please remember that Fort DeSoto is not Nickerson Beach :). Please leave a comment and let us know which of the six DeSoto images here is your favorite and why. Muir Robertson is offering a used Canon EF 300mm f/2.8L IS USM lens in like-new condition–used only twice. The sale includes the Lens Trunk with a nice dent in on one corner (the empty case was damaged during a move), the Canon drop-in polarizer, the Really Right Stuff leow foot, a Canon 1.4X IITC, a Canon 2XII TC, II teleconverters, and insured ground shipping to lower 48 US addresses. The price for this package is an incredibly low $3199. Interested folks please contact Muir first by e-mail and then by phone at 513-314-2471. The older version of the 300 f/2.8 is just as versatile as the version II. And with the tripod collar removed, they weigh just about the same. Many folks swear that the older version is every bit as sharp as the new lens. And the version II TCs perform just fine with the older lenses. The 1.4XII TC is the equal of the 1.4X III TC when used with the older lenses. The 2X II TC is not quite as sharp as the 2X III TC. All in all this package represents an incredible value. Muir Robertson is also offering a used Canon EOS-1D Mark IV in very good + condition for a very low $2900 with several extras. The sale includes all the original accessories and cables, the battery charger, the original packaging, a Really Right Stuff L bracket, a large Hoodman rubber replacement eyecup (this helps folks who use glasses and on bright days), and insured ground shipping to lower 48 US addresses. Your new camera will be shipped after your cashiers or personal check clears. Buy Both and Save $200! Buy both of the above packages and you will enjoy a $200 discount; the total for the lens and the MIV and all the extras is $5899. Remember that a pro body like the 1D IV will drive AF faster than a 7D or any other pro-sumer body including the EOS-5D Mark III. Greg Gulbransen is very much looking to this IPT. 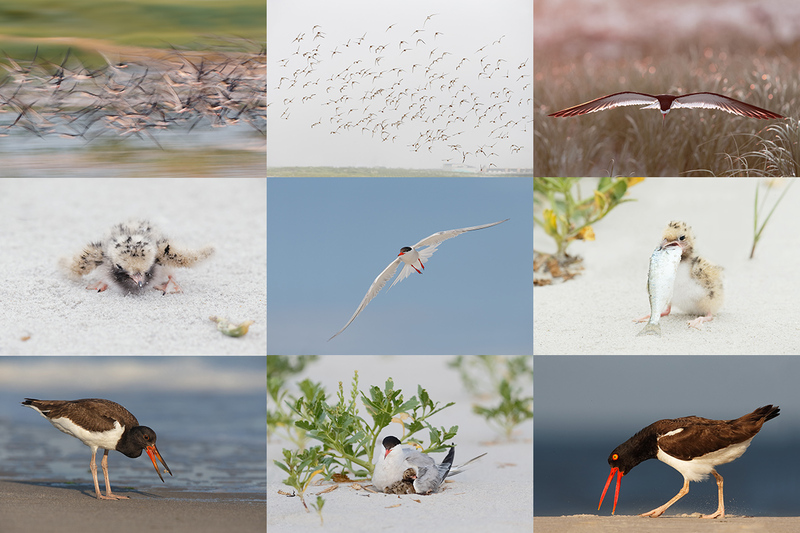 Join us on Long Island, NY next summer to photograph Black Skimmers, Common Terns with chicks, American Oystercatcher families, and possibly some just-hatched Black Skimmer chicks. Things are looking great. The opportunities will include chances to photograph a variety of breeding behaviors including courtship feeding, display flight and combat, and copulations. Car-pooling is recommended; if we opt to return to the beach before 5pm there is a $30/vehicle parking fee that is not included so it is best to share that expense. Parking in the morning is free. Artie, I am also very impressed with my 300 II 2.8 with and without TCs. Bought it last month and never looked back. Traded in my Sigma 120-300 2.8 the oldest version, which basically paid for the TCs. Anyway one question, what do you mean by just ahead of the sun angle. Since the sun is to the east on the gulf side, its kinda behind you anyway. So do you mean a little north or a little south or doesn’t it matter? I truly hope that you used one of our affiliate links for your purchase. Doing so does not cost folks a single penny and helps support all the work that I do here. What I meant, and I should have explained it a bit more carefully, is that if the sun is coming right over the top of your head with the birds walking to your left, if you sit down right on sun angle in one minute they will be walking away from the light and away from you. By positioning yourself to the left of the birds, slightly off sun angle, you can not only get a bit closer without scaring them but you will get to spend more time with them just in front of and right on sun angle. After they walk by you simply stand up, go past them, and repeat. A wonderful variety of species and images, as usual. My favorite, too, is the AOC. With the shallow DOF rendering the foreground and background OOF it creates an engaging miniature/tilt-shift type of effect. I have found the Nikon 80-400 AF-S VR to be a useful alternative to my 500 VR +/- TCs with tripod for similar situations. I really value your posts and your sharing of your field techniques. They challenge me to think through situations and to be flexible. I hope your shoulders and knee are feeling better! Thank you kind sir. Do you have the new version 80-400? Yes I do and got it just prior to Bosque last November. It’s AF is very fast and is quite sharp. It is however a tad slower at f/4.5-5.6 over its range. It will also function completely with a 1.4X TC @f/8. I have found it to be very versatile as an over the shoulder combo or alone as a walk around lens for multiple subjects. Readily hand holdable too. I am sure both the Canon and Nikon 300’s are measurably sharper, though. I have been experimenting with the Tamron 150-600 which is light enough to carry over my shoulder without a tripod as I go through brush to get to a small pond. Not bad with a crop sensor, but I have not yet had success with birds in flight. For that I use my trusty 300 f4 L with or without the 1.4 extender. In the new listing for the EF 300 f2.8L, you say, “The 2X III TC is not quite as sharp as the 2X III TC.” Typo alert. Amazing, amazing, amazing photography, as usual!!!!! 🙂 and thanks Jerry. It was quite a day. What a day you had. All great images. Loved the egret dancing but the saw the egret portrait and it blew me away. It was so regal I could not stop looking at it. Everyone a winner. I couldn’t agree more. At Ft D I often find my 500/1.4x/tripod rig to be overkill and hampering. I’ve often wondered if a 300/2x combo at 5.6 would be more efficient. That said, I can’t have both so I plan to stick with the 500 so I have the reach when needed. The AOC is my favorite image simply because I’m a sucker for them. Yes indeed, a 70-200/2.8/II. My 1.4x is a II and my 2x is a III. Great. You are good to go for the Bosque IPT. See you there! And you got the TCs right….